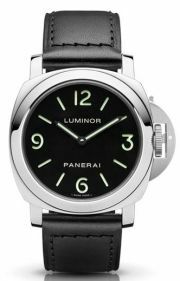 Panerai Panerai Luminor Marina 1950 3 DAYS AUTOMATIC 44MM. 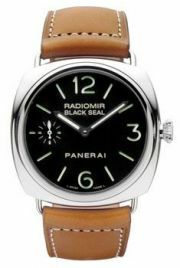 Panerai Panerai Radiomir Black seal csak 1 db 50% kedvezménnyel. 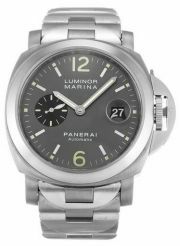 Panerai Panerai Luminor marina Power reserve pam00171, csak nálunk ekkora kedvezménnyel. 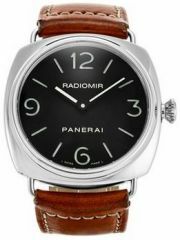 -33/ kedvezmény. 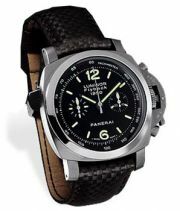 Panerai panerai daylight Chronograph Sylvester Stallone Limited edition. 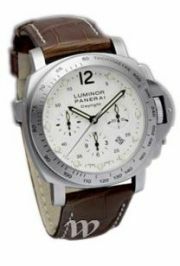 pam00251 -50% KEDVEZMÉNY. 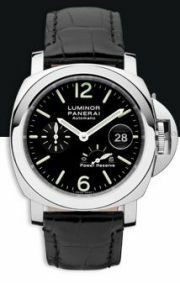 Egyedi AKCIÓ. 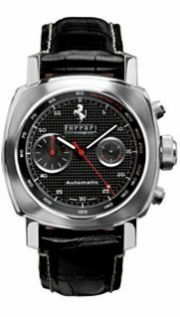 Panerai Panerai Ferrari Granturismo Chronograph LIMITED EDITION. 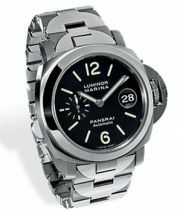 800 db-os limitált kiadás. 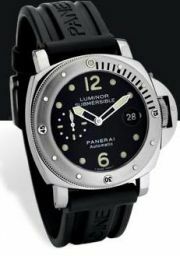 Panerai Panerai Luminor Submersible 44mm, divers watch, 1 db rendkívüli akcióban, -49 % kedvezmény. 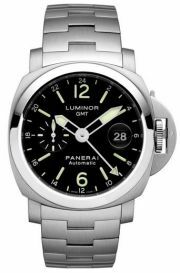 The GMT function of the Luminor Panerai watch enables the local time and the time elsewhere to be read simultaneously, indicated on the dial by an appropriate indicator. 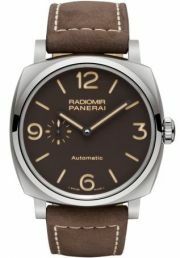 The automatic movement, calibre Panerai OP VIII, makes this watch even more exclusive and unique, not only from the technical point of view but also at the aesthetic level, preserving the small seconds dial at 9 o'clock like the original. 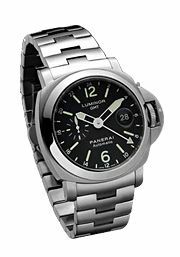 Produced for the first time in 1999, the Luminor Chrono model is a modern, highly technological watch, witness to the continuous development which Panerai carries out on materials, functions and design. 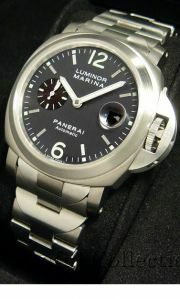 Besides the 40 mm version in titanium and steel, a 44 mm model entirely in steel has been created. 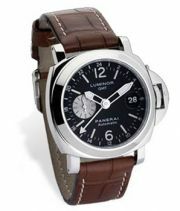 The push-pieces for the chronograph functions are skilfully integrated between the device protecting the crown and the case, entirely consistent with the simplicity and linearity of the characteristic design of the historic Panerai Luminor watch. 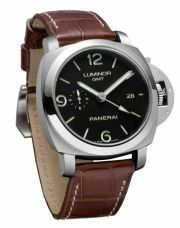 The Luminor Marina Automatic range consists of watches with cases 44 mm or 40 mm in diameter, fitted with a Swiss automatic mechanical movement: the Panerai calibre OP III, with 42-hours power reserve and certified by the C.O.S.C., the Swiss official controller of chronometers. 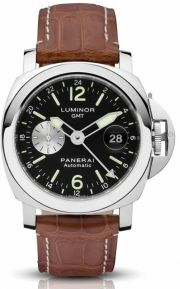 They are available with an alligator strap in different colours or with a metal bracelet of exclusive Panerai design. 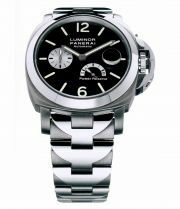 The 44 mm watch bracelet is in titanium and steel, integrated with the case and not interchangeable with a leather strap. 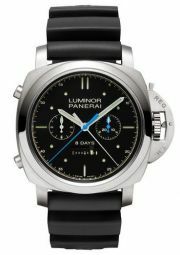 The 40 mm watch bracelet is in polished and brushed steel, interchangeable with a leather strap. 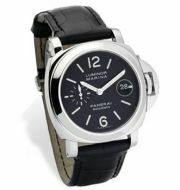 The functions of the Luminor Marina Automatic watches are: hours, minutes, small seconds and date. 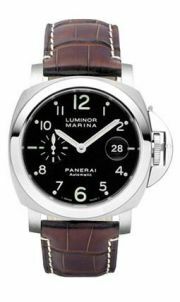 steel, black dial, PAM 00104 The Luminor Marina Automatic range consists of watches with cases 44 mm or 40 mm in diameter, fitted with a Swiss automatic mechanical movement: the Panerai calibre OP III, with 42-hours power reserve and certified by the C.O.S.C., the Swiss official controller of chronometers. 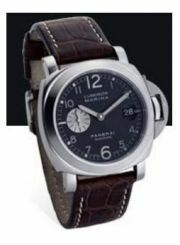 They are available with an alligator strap in different colours or with a metal bracelet of exclusive Panerai design. The 44 mm watch bracelet is in titanium and steel, integrated with the case and not interchangeable with a leather strap. 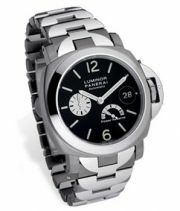 The 40 mm watch bracelet is in polished and brushed steel, interchangeable with a leather strap. 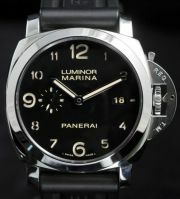 The functions of the Luminor Marina Automatic watches are: hours, minutes, small seconds and date.